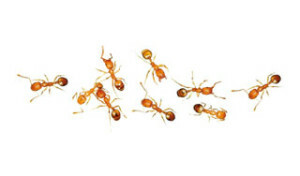 Pharaoh Ants – Pesterminate Inc.
Pharaoh ants live in imperceptible multi-colonies and are very difficult to eradicate. More than a dozen pathogenic bacteria have been found on pharaoh ants, which can be spread to your food. Please note, the detection and elimination of pharaoh ants is a difficult and lengthy process. Liquids, aerosol and dusts are to never be used by the homeowner after our service, as this will cause the colony to bud (scatter). Our guarantee is extended to most home owners, please contact for further details.